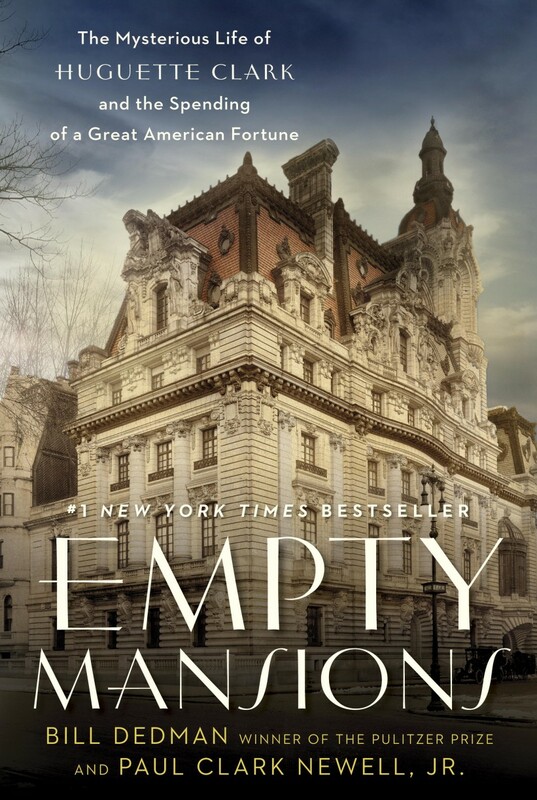 News: Empty Mansions has been named the nonfiction book of the year by the 600+ clubs of the Pulpwood Queens. Read the announcement. Have you seen that some authors are charging book clubs high fees to meet with them? Save your money. If your book club is discussing Empty Mansions, arrange for Bill Dedman to meet with your group in person or via phone or Skype for free. Send an email to Bill Dedman. Here's a sheet of information about the book. We hope you'll share this with each of your members. A discussion guide for book clubs has been published by Random House Reader’s Circle. It includes an interview with the authors by Patrick McCord of The Editing Co. in Westport, Connecticut, and in the same document you'll see discussion questions for readers. Updated pages are available giving the results of the Clark estate settlement. Those pages are already in all paperback copies, and in later hardcover copies, and should also be in any electronic books, though updates for ebooks seem to be hit or miss. You can get those updated pages in this PDF file. The audio book is perfect for use during a book club discussion, with Huguette Clark’s voice in excerpts from her conversations with co-author Paul Clark Newell Jr. The book is read by Kimberly Farr. You can see details, listen to an excerpt and find various outlets for downloading the audiobook via Random House Audio. You can buy the audio book directly from Audible, eMusic or through your iTunes player. Here's an excerpt from the Empty Mansions audio book, as read by actress Kimberly Farr. This is six minutes from Chapter 1, describing Huguette's arrival in America and the Clark Mansion on Fifth Avenue. Click on the control below to play the audio. And click here to buy the audio book, which can be downloaded to a computer, smartphone or tablet.